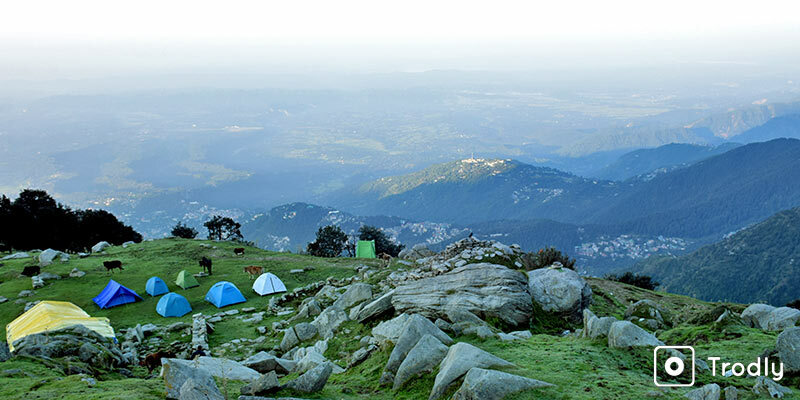 Triund Trek is a perfect getaway to the heights in McLeodganj. Situated between the Dhauladhar Mountains and Kangra valley, Triund Trek is one of the most sought-after treks in Himachal Pradesh. Triund Trek is not a tough nut to crack but it nevertheless gifts you the stunning views and thrills any other high altitude treks can give. 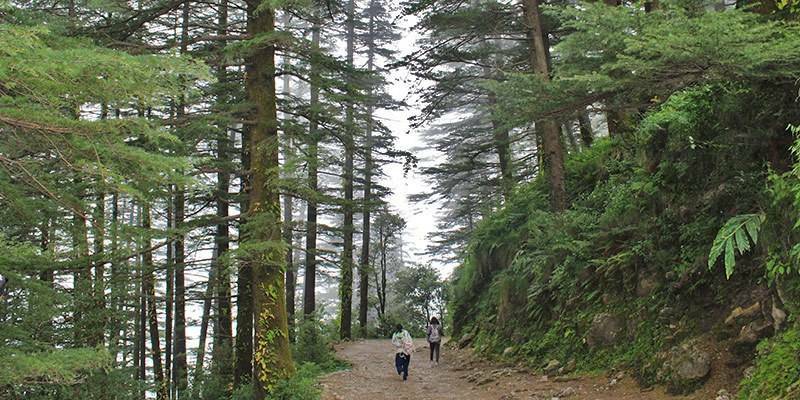 The trail goes through the forest of deodar, rhododendron and oak, the fresh air here will soothe your mind and muscles while you negotiate the tough curves. Triund trek is for all and most popular activity in Mcleod ganj and you will definitely not regret it. In this guide you will find all the information you would need to plan for a delightful Triund trekking & camping experience. One of the reasons for the popularity of Triund Trek is that it is doable for the most part of the year. Although it does rain heavily for few days during monsoons which make it hard in the monsoon season. Other than during few days of peak winter you are welcome to tread on Triund any time. Triund becomes literally inaccessible during few days of the winter due to snowfall and gets closed for few weeks of January & February. The best time for the Triund trek is during the summer months of March to June and September to mid-December when the weather is pleasant. Is Triund trek open in December & January? Triund remains open till 31st December usually and up to 1st week of January sometimes. It depends on how much snow has fallen in the beginning of the winter season and around those dates. Once Triund trek closes in January it open late February or early March. Again opening dates would depend upon level of snow that has fallen in winter season. 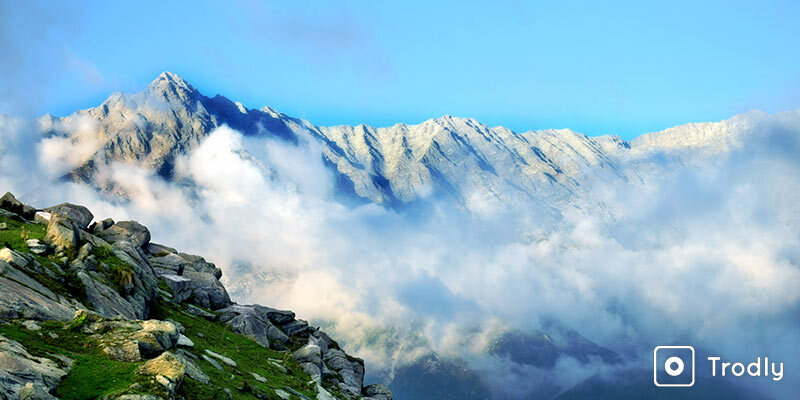 To trek to Triund hill, you first have to reach McLeodganj. There are frequent Volvo buses to McLeodganj from Delhi/Chandigarh and tickets can be booked online. The bus usually takes 11 to 12 hours to reach McLeodganj from Delhi. McLeodganj is about 8 km from Dharamshala and you can also take a shared cab or bus (every half hour) to reach there. Pathankot railway station is the closest railway station and you can reach McLeodganj by bus or shared cab from there. The nearest airport is at Gaggal, about 17 km from McLeodganj. The reporting location for the trek is in Dharmkot, Mcleodganj, just about a kilometer from bus stand. You can either walk from bus stand or take a taxi to reach base camp. You will receive the address of the base camp in booking voucher. Few treks start from Gallu Devi Temple also but these are usually not the best options. 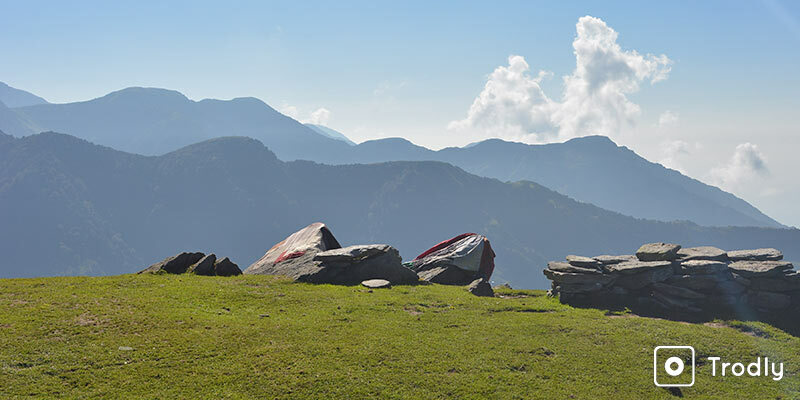 Triund trek is regarded as an easy trek and is considered as a right choice for a beginner. The whole trek is nearly 9 km and out of that 4 km is a steep but easy climb. However, the last 2 km can be a bit tough for some. The trail is famous for its 22 curves. Your fitness won’t be challenged but your will to finish will be. There are some canteens and tea stalls on your way up. If you need to take a pit stop or sip some tea to catch your breath then you can have it in those shops. You don’t need to carry any advance trekking gear for the Triund trek. If you are not planning to spend your night at the summit then the list is really thin. Just a fleece jacket, gloves and maybe a windcheater will do the job. High ankle shoes are usually recommended for the treks though for this trek, shows with good grip would work just fine. Keeping some sunscreen and a sun cap is also good. For water, you can carry a reusable water bottle which can be filled with some bottled water that you can buy on the way. And if you can survive with snacks then there is a small shop at Triund. If not, then you should definitely carry some packed lunch. Things are a little different if you want to camp at Triund. If you book through a professional agency then most of the nitty gritties will be taken care by them including camping tents and food. Then you can enjoy the terrain of Triund without anything but your stamina to worry about! Triund trek is quite an easy trek except last 1 kilometer which is slightly steep. Some people reach the top in less than 3 hours as well. You just need to be psychically fit to complete this trek. People of all ages from children over 5 years if age to senior citizens do Triund trek. But if weather conditions are bad then it can increase the difficulties. Extra care during the hike needs to be taken during rainy and winter season. Make sure you carry rain coats and proper woolen clothing as per the season. Report by 10:00 am at the Mcleodganj basecamp, the trek starts off to Triund, via Dhramkot & Naddi. Overnight stay in tents at Triund Top campsite. After breakfast, check out from Tirund camp and start the trek back to Mcleodganj. By afternoon the trek ends at Mcleodganj Base Camp. Triund Day Hike – Can Triund trek be done in one day? A day hike to Triund is very much possible and could be done if you do not want to camp there for the night and spend a night under the stars in safety of a tent. Do remember that it would be a long day and depending on your walking speed and stamina it would take 9 to 12 hours for you to get back to Mcleodganj, so plan your day accordingly. A day hike started early in the morning is a good way to cover Galu temple and Bhagsu waterfalls as well on this trip. Mcleodganj & Dharamshala have become a hot trekking destinations. Easy accessibility from NCR and Punjab and availability for wide options of treks for all people has made both these locations a prime attraction for adventure enthusiasts. Thanks to large crowds and permanent camp setup structures, cost of treks and other adventure activities is very nominal. This is another reason people travel to this reason often. If you want to experience the un-matchable beauty of Triund furthermore then there is Laka glacier and Indrahar pass trek is waiting for you. You can breathe in the beauty of these places by camping. The shepherd’s meadow at Laka glacier and the spellbinding beauty of Indrahar pass will make you fall in love with this mountain range. Once you cross Triund, the difficulty level of the terrain starts to increase. So venture out if you can take on some tough terrain. If you find Triund trek to be too easy for you or you want an extra mile for more adventure then you should opt for Laka Glacier Trek. 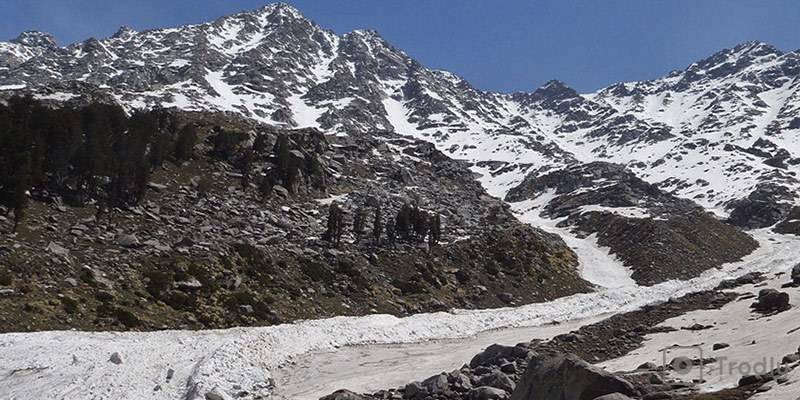 It is a further day hike from Triund and takes you to Laka Got next to the glacier. 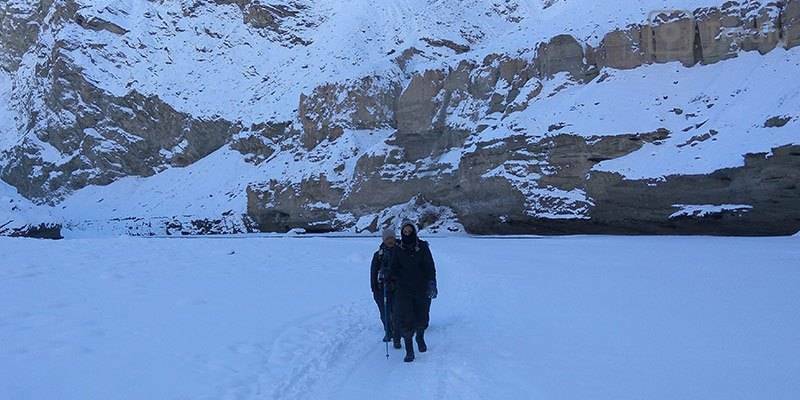 The snow at Laka glacier will melt away before August so if you want to get chilled in the white snow then visit Laka glacier during the month of April and May. Right before reaching the glacier you will go through the shepherds’ meadow, a place where the local shepherds gather with their sheep, surrounded by snow clad mountains and misty valleys. 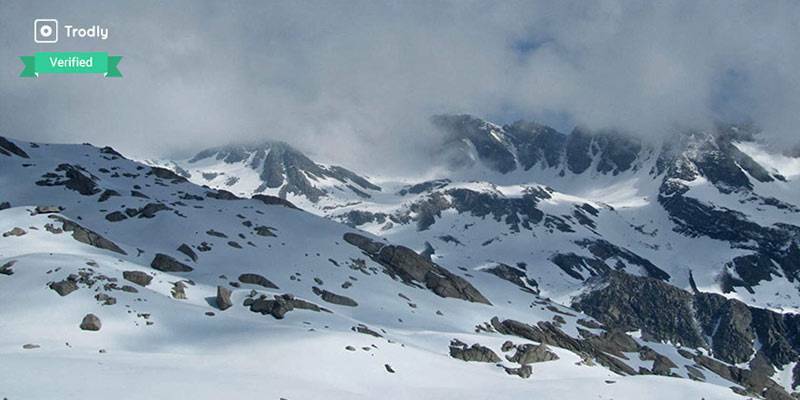 During summers Laka glacier trek is the best option to go beyond Triund snowline. 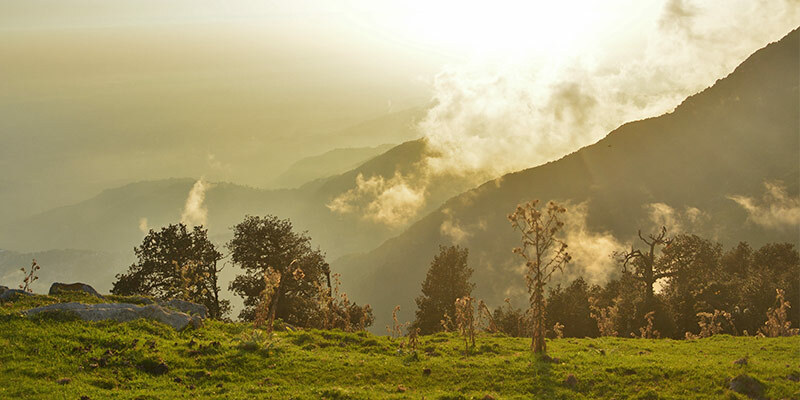 Indrahar pass is located at almost 1400 metres above Triund. The Kangra and Chamba valley in the Dhauladhar range of Himalayas are connected by the Indrahar pass. The view this place offers is pure ecstasy. The mysterious valleys hiding under thick mountain mists will give you chills. During the Indrahar Pass Trek, you will come across the famous Lahesh caves. It’s a place where you can stay for a night or a halt during your trek. However, this trek is a perfect opportunity for trekkers with some previous experience. The steep and rigorous climb to Dhauladhar mountains will test the better of trekkers. 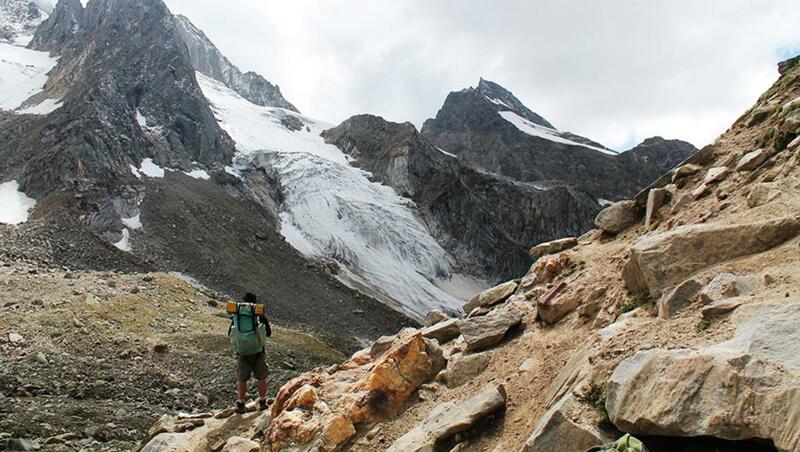 This particular trek starts from Mcleodganj and ends at Chamba. Out of the 5 days, on day-1 to trek is when you’ll be crossing Indrahar pass to go to the other side of the mountain in Chatru Parao village. Next day will be in Kuarsi, a quaint little gaddi (shepherd) village, tucked away in the mountains in the Chamba region. During the second day of the trek, you get the opportunity to camp in the famous Lahesh cave. Then, the next days camp will be at the Chatru Parao village. This village offers some irreplaceable panoramic views of the Pir Panjal ranges. This trek gives you the opportunity to explore more beyond Triund. It will be a great offbeat experience for any trekking enthusiast. Except few weeks of January and February, Triund trek remains open for most part of the year. Any trek in Himalayas increases in difficulty level during Monsoons. Triund can be easily done in Monsoon season provided you are prepared for the conditions. You must make sure you are carrying a raincoat and proper trekking shoes. Temperatures also plummet sometimes at night so carrying a jacket or other warm clothing is also recommended.